Cello Trio - "Tango Brasileiro"
Indulge in the velvety tones of 20th century classical Brazilian music, swinging and melancholic at the same time. From the originator of the Brazilian tango - if not the tango itself - Ernesto Nazareth (b. 1863) through Brazils most famous composer Heitor Villa-Lobos (b. 1889) up to Jaime M. Zenamon (b. 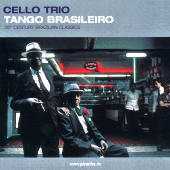 1953) the album of CELLO TRIO includes purely Brazilian composi-tions, rightly famed for their original blend of up-to-date European and indigenous traits. The pieces are interpreted by the Brazilian-German CELLO TRIO of Márcio Carneiro, Peter Dauelsberg and Matias de Oliveira Pinto.